"Galápagos" redirects here. For other uses, see Galápagos (disambiguation). Volcanism has been continuous on the Galápagos Islands for at least 20 myr, and perhaps even longer. The mantle plume beneath the east-ward moving Nazca Plate (51 km/myr) has given rise to a 3-kilometre-thick platform under the island chain and seamounts. Besides the Galápagos Archipelago, other key tectonic features in the region include the Northern Galápagos Volcanic Province between the archipelago and the Galápagos Spreading Center (GSC) 200 km to the north at the boundary of the Nazca Plate and the Cocos Plate. This spreading center truncates into the East Pacific Rise on the west and is bounded by the Cocos Ridge and Carnegie Ridge in the east. Furthermore, the Galápagos Hotspot is at the northern boundary of the Pacific Large Low Shear Velocity Province while the Easter Hotspot is on the southern boundary. The Galápagos Archipelago is characterized by numerous contemporaneous volcanoes, some with plume magma sources, others from the asthenosphere, possibly due to the young and thin oceanic crust. The GSC caused structural weaknesses in this thin lithosphere leading to eruptions forming the Galápagos Platform. Fernandina and Isabela in particular are aligned along these weaknesses. Lacking a well-defined rift zone, the islands have a high rate of inflation prior to eruption. 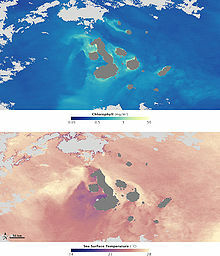 Sierra Negra on Isabela Island experienced a 240 cm uplift between 1992 and 1998, most recent eruption in 2005, while Fernandina on Fernandina Island indicated an uplift of 90 cm, most recent eruption in 2009. Alcedo on Isabela Island had an uplift of greater than 90 cm, most recent eruption in 1993. Additional characteristics of the Galápagos Archipelago are closer volcano spacing, smaller volcano sizes, and larger calderas. For instance, Isabela Island includes 6 major volcanoes, Ecuador, Wolf, Darwin, Alcedo, Sierra Negraa and Cerro Azul, with most recent eruptions ranging from 1813 to 2008. The neighboring islands of Santiago and Fernandina last erupted in 1906 and 2009, respectively. Overall, the 9 active volcanoes in the archipelago have erupted 24 times between 1961 and 2011. The shape of these volcanoes is that of an "overturned soup bowl" as opposed to the "overturned saucer plate" of the Hawaiian Islands. The Galápagos's shape is due to the pattern of radial and circumferential fissure, radial on the flanks, but circumferential near the caldera summits. It is the circumferential fissures which give rise to stacks of short lava flows. The volcanoes at the west end of the archipelago are in general, taller, younger, have well developed calderas, and are mostly composed of tholeiitic basalt, while those on the east are shorter, older, lack calderas, and have a more diverse composition. The ages of the islands, from west to east are 0.05 Ma for Fernandina, 0.65 Ma for Isabela, 1.10 Ma for Santiago, 1.7 Ma for Santa Cruz, 2.90 Ma for Santa Fe, and 3.2 Ma for San Cristobal. The calderas on Sierra Negra and Alcedo have active fault systems. The Sierra Negra fault is associated with a sill 2 km below the caldera. The caldera on Fernandina experienced the largest basaltic volcano collapse in history, with the 1968 phreatomagmatic eruption. Fernandina has also been the most active volcano since 1790, with recent eruptions in 1991, 1995, 2005, and 2009, and the entire surface has been covered in numerous flows since 4.3 Ka. The western volcanoes have numerous tuff cones. The islands are located in the eastern Pacific Ocean, 973 km (605 mi) off the west coast of South America. The closest land mass is that of mainland Ecuador, the country to which they belong, 926 km (500 nmi) to the east. An animated tour of the Galápagos. NASA oceanographer Gene Carl Feldman reflects on his unique perspective on this region. The islands are found at the coordinates 1°40'N–1°36'S, 89°16'–92°01'W. Straddling the equator, islands in the chain are located in both the northern and southern hemispheres, with Volcán Wolf and Volcán Ecuador on Isla Isabela being directly on the equator. Española Island, the southernmost islet of the archipelago, and Darwin Island, the northernmost one, are spread out over a distance of 220 km (137 mi). The International Hydrographic Organization (IHO) considers them wholly within the South Pacific Ocean, however. The Galápagos Archipelago consists of 7,880 km2 (3,040 sq mi) of land spread over 45,000 km2 (17,000 sq mi) of ocean. The largest of the islands, Isabela, measures 2,250 square miles (5,800 km2) and makes up close to three-quarters of the total land area of the Galápagos. Volcán Wolf on Isabela is the highest point, with an elevation of 1,707 m (5,600 ft) above sea level. While the older islands have disappeared below the sea as they moved away from the mantle plume, the youngest islands, Isabela and Fernandina, are still being formed. In April 2009, lava from the volcanic island Fernandina started flowing both towards the island's shoreline and into the center caldera. In late June 2018, Sierra Negra, one of five volcanoes on Isabela and one of the most active in the Galapagos archipelago, began erupting for the first time since 2005. Lava flows made their way to the coastline, prompting the evacuation of about fifty nearby residents and restricting tourist access. Darwin (Culpepper) Island – This island is named after Charles Darwin. It has an area of 1.1 km2 (0.42 sq mi) and a maximum altitude of 168 metres (551 ft). Here fur seals, frigates, marine iguanas, swallow-tailed gulls, sea lions, whales, marine turtles, and red-footed and Nazca boobies can be seen. Española (Hood) Island – Its name was given in honor of Spain. It also is known as Hood, after Viscount Samuel Hood. It has an area of 60 km2 (23 sq mi) and a maximum altitude of 206 metres (676 ft). Española is the oldest island at around 3.5 million years, and the southernmost in the group. Due to its remote location, Española has a large number of endemic species. It has its own species of lava lizard, mockingbird, and Galápagos tortoise. Española's marine iguanas exhibit a distinctive red coloration change between the breeding season. Española is the only place where the waved albatross nests. Some of the birds have attempted to breed on Genovesa (Tower) Island, but unsuccessfully. Española's steep cliffs serve as the perfect runways for these birds, which take off for their ocean feeding grounds near the mainland of Ecuador and Peru. Española has two visitor sites. Gardner Bay is a swimming and snorkelling site, and offers a great beach. Punta Suarez has migrant, resident, and endemic wildlife, including brightly colored marine iguanas, Española lava lizards, hood mockingbirds, swallow-tailed gulls, blue-footed boobies, Nazca boobies, red-billed tropicbirds, Galápagos hawks, three species of Darwin's finches, and the waved albatross. Floreana (Charles or Santa María) Island – It was named after Juan José Flores, the first President of Ecuador, during whose administration the government of Ecuador took possession of the archipelago. It is also called Santa Maria, after one of the caravels of Columbus. It has an area of 173 km2 (67 sq mi) and a maximum elevation of 640 m (2,100 ft). It is one of the islands with the most interesting human history, and one of the earliest to be inhabited. Flamingos and green sea turtles nest (December to May) on this island. The patapegada or Galápagos petrel, a sea bird which spends most of its life away from land, is found here. At Post Office Bay, where 19th-century whalers kept a wooden barrel that served as a post office, mail could be picked up and delivered to its destinations, mainly Europe and the United States, by ships on their way home. At the "Devil's Crown", an underwater volcanic cone and coral formations are found. Isabela (Albemarle) Island – This island was named in honor of Queen Isabela. With an area of 4,640 km2 (1,790 sq mi), it is the largest island of the Galápagos. Its highest point is Volcán Wolf, with an altitude of 1,707 m (5,600 ft). The island's seahorse shape is the product of the merging of six large volcanoes into a single land mass. On this island, Galápagos penguins, flightless cormorants, marine iguanas, pelicans and Sally Lightfoot crabs abound. At the skirts and calderas of the volcanoes of Isabela, land iguanas and Galápagos tortoises can be observed, as well as Darwin finches, Galápagos hawks, Galápagos doves and very interesting lowland vegetation. The third-largest human settlement of the archipelago, Puerto Villamil, is located at the southeastern tip of the island. It is the only island to have the equator run across it. It is also the only place in the world where a penguin can be in its natural habitat in the Northern Hemisphere. Marchena (Bindloe) Island – Named after Fray Antonio Marchena, it has an area of 130 km2 (50 sq mi) and a maximum altitude of 343 m (1,125 ft). 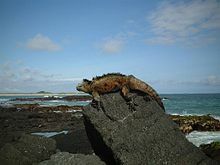 Galapagos hawks and sea lions inhabit this island, and it is home to the Marchena lava lizard, an endemic animal. North Seymour Island – Its name was given after an English nobleman, Lord Hugh Seymour. It has an area of 1.9 km2 (0.73 sq mi) and a maximum altitude of 28 m (92 ft). This island is home to a large population of blue-footed boobies and swallow-tailed gulls. It hosts one of the largest populations of frigate birds. It was formed from geological uplift. Pinzón (Duncan) Island – Named after the Pinzón brothers, captains of the Pinta and Niña caravels, it has an area of 18 km2 (6.9 sq mi) and a maximum altitude of 458 m (1,503 ft). Rábida (Jervis) Island – It bears the name of the convent of Rábida, where Columbus left his son during his voyage to the Americas. It has an area of 4.95 km2 (1.91 sq mi) and a maximum altitude of 367 m (1,204 ft). The high amount of iron contained in the lava at Rábida gives it a distinctive red colour. White-cheeked pintail ducks live in a saltwater lagoon close to the beach, where brown pelicans and boobies have built their nests. Until recently, flamingos were also found in the lagoon, but they have since moved on to other islands, likely due to a lack of food on Rábida. Nine species of finches have been reported in this island. San Cristóbal (Chatham) Island – It bears the name of the patron saint of seafarers, "St. Christopher". Its English name was given after William Pitt, 1st Earl of Chatham. It has an area of 558 km2 (215 sq mi) and its highest point rises to 730 m (2,400 ft). This is the first island in the Galápagos Archipelago Charles Darwin visited during his voyage on the Beagle. This islands hosts frigate birds, sea lions, giant tortoises, blue- and red-footed boobies, tropicbirds, marine iguanas, dolphins and swallow-tailed gulls. Its vegetation includes Calandrinia galapagos, Lecocarpus darwinii, and trees such as Lignum vitae. The largest freshwater lake in the archipelago, Laguna El Junco, is located in the highlands of San Cristóbal. The capital of the province of Galápagos is Puerto Baquerizo Moreno, which lies at the southern tip of the island, and is close to San Cristóbal Airport. Santa Cruz (Indefatigable) Island – Given the name of the Holy Cross in Spanish, its English name derives from the British vessel HMS Indefatigable. It has an area of 986 km2 (381 sq mi) and a maximum altitude of 864.5 m (2,836 ft). Santa Cruz hosts the largest human population in the archipelago, the town of Puerto Ayora. The Charles Darwin Research Station and the headquarters of the Galápagos National Park Service are located here. The GNPS and CDRS operate a tortoise breeding centre here, where young tortoises are hatched, reared, and prepared to be reintroduced to their natural habitat. The Highlands of Santa Cruz offer exuberant flora, and are famous for the lava tunnels. Large tortoise populations are found here. Black Turtle Cove is a site surrounded by mangroves, which sea turtles, rays and small sharks sometimes use as a mating area. Cerro Dragón, known for its flamingo lagoon, is also located here, and along the trail one may see land iguanas foraging. Santa Fe (Barrington) Island – Named after a city in Spain, it has an area of 24 km2 (9.3 sq mi) and a maximum altitude of 259 m (850 ft). Santa Fe hosts a forest of Opuntia cactus, which are the largest of the archipelago, and Palo Santo. Weathered cliffs provide a haven for swallow-tailed gulls, red-billed tropic birds and shearwater petrels. Santa Fe species of land iguanas are often seen, as well as lava lizards. Santiago (San Salvador, James) Island – Its name is equivalent to Saint James in English; it is also known as San Salvador, after the first island discovered by Columbus in the Caribbean Sea. This island has an area of 585 km2 (226 sq mi) and a maximum altitude of 907 m (2,976 ft). Marine iguanas, sea lions, fur seals, land and sea turtles, flamingos, dolphins and sharks are found here. Pigs and goats, which were introduced by humans to the islands and have caused great harm to the endemic species, have been eradicated (pigs by 2002; goats by the end of 2006). Darwin finches and Galápagos hawks are usually seen, as well as a colony of fur seals. At Sulivan Bay, a recent (around 100 years ago) pahoehoe lava flow can be observed. Wolf (Wenman) Island – This island was named after the German geologist Theodor Wolf. It has an area of 1.3 km2 (0.50 sq mi) and a maximum altitude of 253 m (830 ft). Here, fur seals, frigatebirds, Nazca and red-footed boobies, marine iguanas, sharks, whales, dolphins and swallow-tailed gulls can be seen. The most famous resident is the vampire finch, which feeds partly on blood pecked from other birds, and is only found on this island. South Plaza Island (Plaza Sur) – It is named in honor of a former president of Ecuador, General Leónidas Plaza. It has an area of 0.13 km2 (0.050 sq mi) and a maximum altitude of 23 m (75 ft). The flora of South Plaza includes Opuntia cactus and Sesuvium plants, which form a reddish carpet on top of the lava formations. Iguanas (land, marine and some hybrids of both species) are abundant, and large numbers of birds can be observed from the cliffs at the southern part of the island, including tropic birds and swallow-tailed gulls. There are significant changes in precipitation from one year to another, too. At Charles Darwin Station, the precipitation during March 1969 was 249.0 mm (9.80 in), but during March 1970, it was only 1.2 mm (0.047 in). According to a 1952 study by Thor Heyerdahl and Arne Skjølsvold, potsherds and other artifacts from several sites on the islands suggest visitation by South American peoples in pre-Columbian era. The group located an Inca flute and shards from more than 130 pieces of ceramics, which were later identified as pre-Incan. However, no remains of graves, ceremonial vessels and constructions have ever been found, suggesting no permanent settlement occurred before the Spanish arrived in the 16th century. It is not clear who the first visitors to the islands were, but they were probably sailors blown off course or people on hapless fishing boats blown out to sea. Most of them were likely unimpressed by the lack of fresh water on the islands. Whether the Incas ever made it here is disputed; in 1572, Spanish chronicler Pedro Sarmiento de Gamboa claimed that Topa Inca Yupanqui, the second Sapa Inca of the Inca Empire had visited the archipelago, but there is little evidence for this, and many experts consider it a far-fetched legend, especially since the Incas were not seafaring people. The first English captain to visit the Galápagos Islands was Richard Hawkins, in 1593. Until the early 19th century, the archipelago was often used as a hideout by mostly English pirates who attacked a Spanish treasure fleet carrying gold and silver from South America to Spain. In 1818 the Nantucket whaleship Globe, under Captain George Washington Gardner, discovered a "mother lode" of sperm whales some thousand miles west of the South American coast approximately at the equator. He returned to Nantucket in 1820 with more than 2000 barrels of sperm whale oil and the news of his discovery. This led to an influx of whaleships to exploit the new whaling ground and the Galápagos Islands became a frequent stop for the whalers both before and after visiting what came to be known as the Offshore Grounds. This led to the establishment in the Galápagos Islands of a kind of unofficial "post office" where whaleships stopped to pick up and drop off letters as well as for provisioning and repairing. The voyage of the Beagle brought the survey ship HMS Beagle, under captain Robert FitzRoy, to the Galápagos on 15 September 1835 to survey approaches to harbours. The captain and others on board, including his companion, the young naturalist Charles Darwin, made observations on the geology and biology on Chatham, Charles, Albemarle and James islands before they left on 20 October to continue on their round-the-world expedition. Primarily a geologist at the time, Darwin was impressed by the quantity of volcanic craters they saw, later referring to the archipelago as "that land of craters". His study of several volcanic formations over the 5 weeks he stayed in the islands, led to several important geological discoveries, including the first, correct explanation for how volcanic tuff is formed. Darwin noticed the mockingbirds differed between islands, though he thought the birds now known as Darwin's finches were unrelated to each other, and did not bother labelling them by island. Nicholas Lawson, acting Governor of Galápagos for the Republic of the Equator, met them on Charles Island, and as they walked to the prison colony, Lawson told Darwin the tortoises differed from island to island. Towards the end of the voyage, Darwin speculated that the distribution of the mockingbirds and the tortoises might "undermine the stability of Species". When specimens of birds were analyzed on his return to England, it was found that many apparently different kinds of birds were species of finches, which were unique to islands. These facts were crucial in Darwin's development of his theory of natural selection explaining evolution, which was presented in On the Origin of Species. In April 1888 USS Albatross, a Navy-manned research vessel assigned to the United States Fish Commission, briefly touched eight islands in the Galapagos group for specimens; this included Wreck Bay on Chatham Island (now San Cristóbal Island) on 4 April and Charles Island (now Floreana Island) on 8 April. For a long time during the early 1900s and at least through 1929, a cash-strapped Ecuador had reached out for potential buyers of the islands to alleviate financial troubles at home. The US had repeatedly expressed its interest in buying the islands for military use as they were positioned strategically guarding the Panama Canal. Besides the United States, Japan, Germany and Chile also expressed interest in establishing bases in the islands at the turn of the century. Chile had previously acquired the Straits of Magellan and Easter Island for strategic reasons and lieutenant Gregorio Santa Cruz argued in 1903 that possessing an island in equatorial waters, like the Galápagos, would be of great benefit since the geopolitical situation of Chile was expected to drastically change when the Panama Canal opened. Another benefit would be to widen the security radius of Chile. In the 1920s and 1930s, a small wave of European settlers arrived in the islands. There occurred a series of unsolved disappearances on the island of Floreana in the 1930s among the largely European expatriate residents at the time. The Galápagos Affair: Satan Came to Eden is a 2013 feature-length documentary film about the same. Ecuadorian laws provided all colonists with the possibility of receiving twenty hectares each of free land, the right to maintain their citizenship, freedom from taxation for the first ten years in Galápagos, and the right to hunt and fish freely on all uninhabited islands where they might settle. The first European colonists to arrive were Norwegians who settled briefly on Floreana, before moving on to San Cristobal and Santa Cruz. A few years later, other colonists from Europe, America and Ecuador started arriving on the islands, seeking a simpler life. Descendants of the Norwegian Kastdalen family and the German Angermeyer still live on the islands. The largest ethnic group is composed of Ecuadorian Mestizos, the mixed descendants of Spanish colonists and indigenous Native Americans, who arrived mainly in the last century from the continental part of Ecuador. Some descendants of the early European and American colonists on the islands also still remain on the islands. Five of the islands are inhabited: Baltra, Floreana, Isabela, San Cristóbal and Santa Cruz. In 1986, the 70,000 square kilometers (27,000 sq mi) of ocean surrounding the islands was declared a marine reserve, second in size only to Australia's Great Barrier Reef. In 1990, the archipelago became a whale sanctuary. UNESCO recognised the islands in 1978 as a World Heritage Site and in 1985, as a biosphere reserve. This was later extended in December 2001 to include the marine reserve. In July 2010, the World Heritage Committee agreed to remove the Galápagos Islands from its list of precious sites endangered by environmental threats or overuse. Six species of small non-native vertebrates have established self-sufficient populations in Galápagos and may become invasive: Fowler’s snouted tree frog Scinax quinquefasciatus, common house gecko Hemidactylus frenatus, mourning gecko Lepidodactylus lugubris, dwarf gecko Gonatodes caudiscutatus, Peters' leaf-toed gecko Phyllodactylus reissii, and smooth-billed ani Crotophaga ani. Domestic fowl Gallus gallus holds feral populations, which may have self-sufficient populations, but evidence is unclear. The islands' biodiversity is under threat from several sources. The human population is growing at an unsustainable rate of 8% per year (1995). Introduced species have caused damage, and in 1996 a US$5 million, five-year eradication plan commenced in an attempt to rid the islands of introduced species such as goats, rats, deer, and donkeys. Except for the rats, the project was essentially completed in 2006. Rats have only been eliminated from the smaller Galápagos Islands of Rábida and Pinzón. El Niño has adversely affected the marine ecosystem. In January 2001, an oil slick from a stranded tanker threatened the islands, but winds and shifting ocean currents helped disperse the oil before much damage was done. The devastating El Nino of 1982-83 saw almost six times as much rain as normal in the Galapagos and created a wildlife catastrophe. The 1997–98 El Niño adversely affected wildlife in the waters surrounding the islands, as the waters were 5 °C (9 °F) warmer than normal. Corals and barnacles suffered, hammerhead sharks were driven away, and most of the island's seabirds failed to breed in 1997–98. 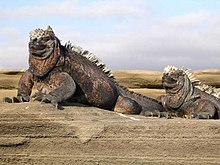 The mortality rate of marine iguanas rose as the green algae they feed on was replaced by inedible red algae. During the 1982–83 El Niño, 70% of the marine iguanas starved to death because of this. ^ "Censo 2010". Instituto Nacional de Estadística y Censos. 2010. Archived from the original on 11 December 2011. Retrieved 13 December 2011. ^ "History Of The Galapagos Islands Facts & Charles Darwin History". www.quasarex.com. Retrieved 2018-10-18. ^ Mittlestaedt, Eric; d'Ozouville, Noemi; Harpp, Karen; Graham, David (2014). Harpp, Karen; Mittelstaedt, Eric; d'Ozouville, Noemi; Graham, David, eds. Introduction, in The Galapagos: A Natural Laboratory for the Earth Sciences. Hoboken: John Wiley & Sons, Inc. pp. 1–3, 42. ISBN 9781118852415. ^ Harpp, Karen; Hall, Paul; Jackson, Matthew (2014). Harpp, Karen; Mittelstaedt, Eric; d'Ozouville, Noemi; Graham, David, eds. Galapagos and Easter: A Tale of Two Hotspots, in The Galapagos: A Natural Laboratory for the Earth Sciences. Hoboken: John Wiley & Sons, Inc. pp. 27–29. ISBN 9781118852415. ^ a b Geist, Dennis; Bergantz, George; Chadwick, William (2014). Harpp, Karen; Mittelstaedt, Eric; d'Ozouville, Noemi; Graham, David, eds. Galapagos Magma Chambers, in The Galapagos: A Natural Laboratory for the Earth Sciences. Hoboken: John Wiley & Sons, Inc. pp. 56–57. ISBN 9781118852415. ^ a b Poland, Michael (2014). Harpp, Karen; Mittelstaedt, Eric; d'Ozouville, Noemi; Graham, David, eds. Contrasting Volcanism in Hawai'i and the Galapagos, in The Galapagos: A Natural Laboratory for the Earth Sciences. Hoboken: John Wiley & Sons, Inc. pp. 5–21. ISBN 9781118852415. ^ Merlen, Godfrey (2014). Harpp, Karen; Mittelstaedt, Eric; d'Ozouville, Noemi; Graham, David, eds. Plate Tectonics, Evolution, and the Survival of Species: A Modern Day Hotspot, in The Galapagos: A Natural Laboratory for the Earth Sciences. Hoboken: John Wiley & Sons, Inc. p. 122. ISBN 9781118852415. ^ Kurz, Mark; Rowland, Scott; Curtice, Joshua; Saal, Alberto; Naumann, Terry (2014). Harpp, Karen; Mittelstaedt, Eric; d'Ozouville, Noemi; Graham, David, eds. Eruption Rates for Fernandina Volcano: A New Chronology at the Galapagos Hotspot Center, in The Galapagos: A Natural Laboratory for the Earth Sciences. Hoboken: John Wiley & Sons, Inc. pp. 41–44, 49. ISBN 9781118852415. ^ Pearson, David L.; David W. Middleton (1999). The New Key to Ecuador and the Galápagos (3rd ed.). Berkeley: Ulysses Press. ^ White, W. M. (2 October 1997). "A Brief Introduction to the Geology of the Galápagos". Cornell University Earth and Atmospheric Sciences. Retrieved 14 December 2011. ^ Mack, Eric (2 July 2018). "Galapagos Volcanoes Keep Erupting Around One Of The World's Most Incredible Islands". Forbes.com. Forbes. Archived from the original on 12 August 2018. Retrieved 12 August 2018. ^ Miller, B.; Breckheimer, I.; McCleary, A.; Guzmán-Ramirez, L.; Caplow, S.; Jones-Smith, J. & Walsh, S. (2010). "Using stylized agent-based models for population–environment research: a case study from the Galápagos Islands". Population & Environment. 31 (4): 279–287. doi:10.1007/s11111-010-0110-4. PMC 2881671. PMID 20539752. ^ Grant, K. Thalia and Estes, Gregory B. (2009). Darwin in Galápagos: Footsteps to a New World. Princeton: Princeton University Press. ^ Vinueza, L.; Branch, G.; Branch, M.; Bustamante, R. (2006). "Top-down herbivory and bottom-up El Niño effects on Galápagos rocky-shore communities". Ecological Monographs. 76 (1): 111–131. doi:10.1890/04-1957. ^ a b Heyerdahl, Thor; & Skjolsvold, Arne (1956). "Archaeological Evidence of Pre-Spanish Visits to the Galápagos Islands", Memoirs 12, Society for American Archaeology. ^ Cho, Lisa (2005) Moon Galápagos Islands. Avalon Travel Publishing. p. 200. ISBN 163121151X. ^ Stewart, Paul D. (2006). Galápagos: the islands that changed the world. Yale University Press. p. 43. ISBN 978-0-300-12230-5. ^ Jackson, Michael Hume (1993). Galápagos, a natural history. University of Calgary Press. p. 1. ISBN 978-1-895176-07-0. ^ Latorre, Octavio (1995). "Los tesoros escondidos de las Islas Galapagos" (PDF). Noticias de Galapagos (in Spanish) (55): 66. Retrieved 2018-02-21. ^ Porter, D. (1822) Journal of a Cruise Made to the Pacific Ocean. Kessinger Publishing. ^ Tarnmoor, Salvator R. (Herman Melville) (1854) Encantadas or the Enchanted Isles. Putnam's Monthly Magazine of American Literature, Science, and Art. March–May 1854. ^ Nickerson, T. (c. 1876) Account of the Ship Essex Sinking, 1819–1821. Holograph ms. in the Thomas Nickerson Collection, 1819–1876, Folder 1. Nantucket, Massachusetts: Nantucket Historical Society. ^ Grant, K. Thalia and Estes, Gregory B. (2009). Darwin in Galapagos: Footsteps to a New World. Princeton: Princeton University Press. ^ a b Niles Eldredge (Spring 2006). "VQR – Confessions of a Darwinist". The Virginia Quarterly Review. pp. 32–53. Retrieved 26 December 2007. ^ "The Norwegian Who Inspired Darwin". ThorNews. Retrieved July 15, 2016. ^ Larson, Edward J. (2001). Evolution's Workshop: God and Science on the Galápagos Islands. New York, New York: Basic Books. p. 108. ISBN 0-465-03810-7. The Albatross stayed in the archipelago for less than two weeks in 1888, but managed to stop at eight different islands. The ship’s naturalists and crew gathered specimens at each anchorage, concentrating on birds, reptiles, and fish. The landfalls included the abandoned settlement on Charles Island, where the ship’s captain report “great numbers of cattle, horses, mules, donkeys, sheep and hots were running wild” where native species once flourished, and a new sugarcane plantation and cattle ranch on Chatham Island that also encroached on wild habitat. ^ "May Sell Galapagos". from "The United Press". The Pittsburgh Press. 21 January 1929. Retrieved 4 September 2012. ^ Fischer, Ferenc (1999). "¿la guantánamo del océano pacífco? la rivalidad de los ee. uu., alemania, Japón y chile por la adquisición de las islas galápagos antes de la I guerra mundial". El modelo militar prusiano y las fuerzas armadas de Chile 1885-1945 (in Spanish). pécs, Hungary: University Press. pp. 71–87. ^ Tapia, Claudio (2009). La creación de un área de inﬂuencia en América del Sur. Las relaciones políticas, económicas y militares de Chile con Ecuador y Paraguay (1883-1914) (Ph.D.) (in Spanish). instituto de estudios avanzados, Universidad de Santiago de Chile. ^ Garay Vera, Cristián (2011). "La imaginación territorial chilena y la apoteosis de la armada de chile 1888-1940. Otra mirada a los límites "Naturales"". Revista Enfoques (in Spanish). IX (15): 75–95. ^ Stutz, Bruce D. (1995). "The sea cucumber war". Audubon. 97 (3): 16. ^ "Galápagos no longer on List of World Heritage in Danger – News Watch". Blogs.nationalgeographic.com. 29 July 2010. Retrieved 23 May 2012. ^ "Feral dogs and cats in Galápagos". Petsaspests.blogspot.com.es. Retrieved 8 November 2015. ^ Nicholls, Henry (15 May 2013). "Invasive species: The 18-km2 rat trap". Nature. 497 (7449): 306–308. doi:10.1038/497306a. PMID 23676736. Retrieved 8 November 2015. ^ "Invasive Species". Galapagos Conservancy. Retrieved 2016-06-01. ^ a b "Project Isabela". Galapagos Conservancy. Retrieved 2016-12-21. ^ a b John (March 5, 2015). "Project Isabela: When Slaughtering 250,000 Goats Meant Saving A Species". All That Is Interesting. Retrieved 2016-12-21. ^ Cisneros-Heredia, Diego F (2018-02-22). "Non-native small terrestrial vertebrates in the Galapagos". PeerJ Preprints. doi:10.7287/peerj.preprints.26563v1. ISSN 2167-9843. ^ Cisneros-Heredia, Diego F. (2018). "The Hitchhiker Wave: Non-native Small Terrestrial Vertebrates in the Galapagos". Understanding Invasive Species in the Galapagos Islands. Social and Ecological Interactions in the Galapagos Islands. Springer, Cham. pp. 95–139. doi:10.1007/978-3-319-67177-2_7. ISBN 9783319671765. ^ a b Carr, Lindsey A; Stier, Adrian C; Fietz, Katharina; Montero, Ignacio; Gallagher, Austin J; Bruno, John F (2013). "Illegal shark fishing in the Galápagos marine reserve" (PDF). Marine Policy. 39: 317–321. doi:10.1016/j.marpol.2012.12.005. Retrieved 12 March 2013. ^ "World Heritage in Danger List". UNESCO World Heritage. Retrieved 8 August 2007. ^ "World Heritage Committee inscribes the Tombs of Buganda Kings (Uganda) and removes Galápagos Islands (Ecuador)". UNESCO World Heritage. Retrieved 30 July 2010. ^ "BBC NEWS, Sea lions massacred in Galápagos". BBC News. 29 January 2008. Retrieved 23 May 2012. ^ "Post-Rat Eradication and Monitoring on Pinzón". Galapagos Conservancy. Retrieved 2016-12-21. ^ "Galapagos: El Niño and La Niña". Retrieved 2018-11-09. 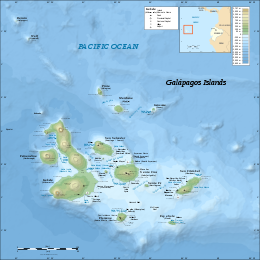 ^ "Galápagos Islands" in The Hutchinson Unabridged Encyclopedia with Atlas and Weather guide (2010). Abington: Helicon. This article incorporates text from a publication now in the public domain: Chisholm, Hugh, ed. (1911). "Galapagos Islands" . Encyclopædia Britannica (11th ed.). Cambridge University Press. Wikisource has the text of the 1911 Encyclopædia Britannica article Galapagos Islands. "Galápagos Islands xeric scrub". Terrestrial Ecoregions. World Wildlife Fund.